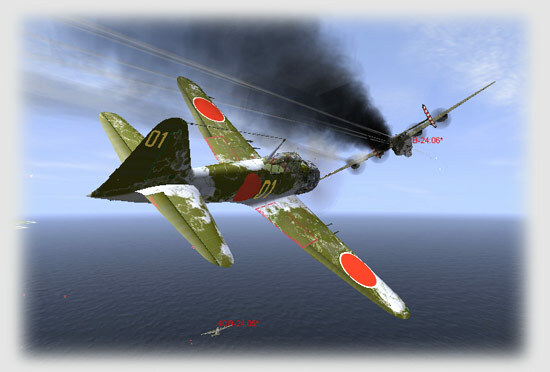 The Japanese get to fly several aircraft as well, to include several models of the A6M, D3A Val, KI 61, 43, 84, and the G4M Betty. Other notable aircraft like the N1K1-J Oscar and the B5N Kate will be part of the Japanese arsenal of AI aircraft. 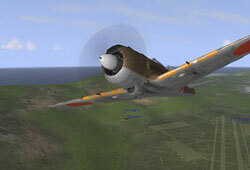 In general, most of the major aircraft that fought in the war are represented in this game. As I said, if you liked the campaign and single player setup of IL-2:Forgotten Battles then you probably will like Pacific Fighters. The games are essentially identical in setup, as a major add on should be. The campaign will be dynamic, like in IL2:FB and players will have the chance to fly campaigns as a pilot for the USN, USMC, or USAAF. Japanese can fly for the Imperial Navy or the Imperial Army and the RAAF, RAF, RN look to be represented in the game for campaigns. Just like campaigns in earlier versions pilots will also get the opportunity to select from various times, bomber vs. fighter positions, and location to start the fight. 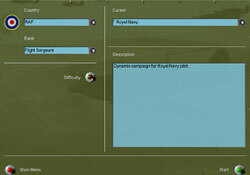 The Mission editor is also in place and I look to see some decent user made scenarios on the scene within hours of release. New maps (I have seen in the game) include the Hawaiian Islands (and Pearl Harbor), Midway, Wake, the Coral Sea, Guadalcanal, Tarawa, and Okinawa. Planned are New Guinea (probably for a Port Moresby related scenario), Burma, Singapore, Rabaul, Rangoon and Luzon among others. Most of the areas of battle are in the game. Graphically the game looks as good as ever. For those folks with the latest Nvidia based cards you will have water effects that will make everyone drool. For those of us with less than the latest hardware (like a Radeon 9800 Pro is anything to sniff at) you will get decent graphics, if not top of the line stuff anymore. No complaints, as you can see from the screenies the game looks pretty good. It runs pretty smooth on my 2.8 gig PV(ht) box as well. I suspect that those folks with lower end computers will find it harder to play this game. Like all of the IL2 series user made skins are useable in the game and can be used both offline as well as online. Online play is essentially unchanged (from what I understand), which is fine by me. The game plans to ship in two forms. For those folks with IL2:FB; Pacific Fighters will install in your game directory and you will be able to use all the planes in both games. In addition there will be a stand alone version which will only install the planes in the Pacific Fightersdirectory. 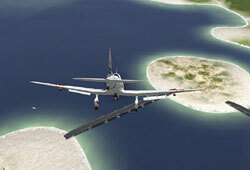 I am not sure if some IL2:FB planes will make it into the Pacific Fighters directory. 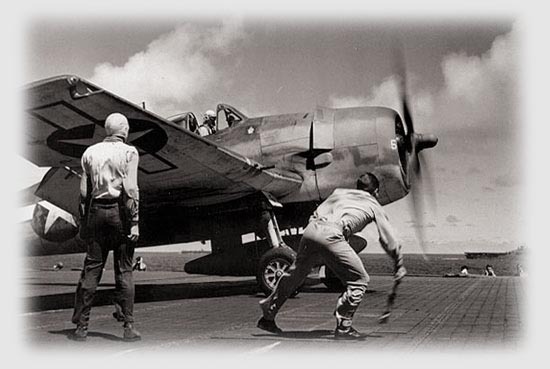 Some, like the P-40E, the Hurricaine II, the P-51 and the P-38 were used extensively in the Pacific Theatre but they aren’t listed directly on the list of planes seen on Pacific Fighters. This could be because changes aren’t going to occur to these planes. I really do hope that they do include these aircraft, they are needed in the game.